New York City buses lurch along at an average speed of 7.5 miles per hour. 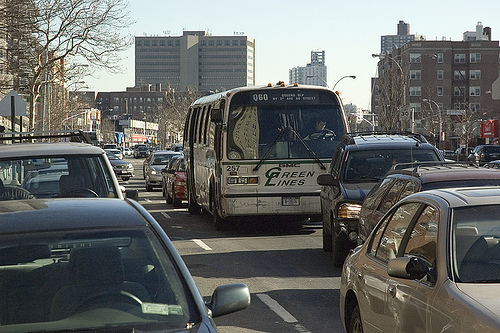 But that is quickly changing, as NYC pushes for BRT. Photo via Pro-Zak. “When [New York] adopts a world-class ‘Bus Rapid Transit’ system, people are going to have a tough time, efficiency-wise, telling a bus apart from a subway—it’s going to be like a subway with a view.” – Kyle Wiswall, general counsel for the Tri-State Transportation Campaign. Bus rapid transit (BRT) systems — AKA “subways on the street” — are finally getting more of the attention they deserve these days. Last week, former President Bill Clinton “gushed” about the benefits of BRT at an Institute for Transportation and Development Policy event. And early this week, New York Magazine published an article by Robert Sullivan about revolutionizing New York’s bus system. New York City is already working on dedicated bus lanes on First and Second Avenues, and just won federal funding for more bus-only lanes by 2012 as part of the 34th Street Transitway project. As Sullivan highlights, much of the impetus behind New York’s push for BRT comes from Jay Walder, the MTA Chairman and Chief Executive Officer chosen by Governor David Paterson last year. Walder was won over by bus rapid transit while working with Transport for London (TfL) from 2001 to 2006. He said he realized that “it was virtually impossible to get anything done on the rail system quickly … so we set out to work on the buses.” So, in spite of Margaret Thatcher’s infamous remark that, “A man who, beyond the age of 26, finds himself on a bus can count himself as a failure,” Walder and his team dedicated themselves to expanding the bus service and making it more efficient. And it was thanks in large part to Walder’s transport plans that London won its bid to host the 2012 Olympics. Now, Walder is working to convince New Yorkers that buses are the transportation of the future in their city, too. This can be tough; after all, the average bus speed is 7.5 miles per hour in New York — the slowest average speed of any U.S. city. Waiting on the curb, you notice that the bus has its own lane, painted terra-cotta, with signs to deflect non-bus traffic. It is not a physically separated lane, the holy grail of Bus Rapid Transit. But it is a lane, and your fellow riders speak of police who patrol it regularly during rush hours. You see the big, roomy bus shelter holding enough people to fill a subway car, and you wonder if everyone will be able to get on. But when the Bx12 SBS pulls up, this monster of mundaneness opens up not one but two doors. If there is a heaven for bus drivers, it has buses with rear-door entrances. The transit-interested rider, upon seeing a bus this size pull up at a station with two-dozen prepaid fares, breaks out his stopwatch. Traffic geeks know that about a third of bus delays comes from passenger-boarding issues, and now the doors of the Bx12 SBS open. The stopwatch is running … Twenty-two people board; about four get off. The doors close; the bus sets off. Total wait time: 23 seconds. As New Yorkers watch the Bx12 whir by on its exclusive lane, they catch a quick glimpse of a bus service that has 98 percent approval from riders — which NYCDOT commissioner Janette Sadik-Khan says happens “about as often as Halley’s Comet” on any of the city’s public transit services. Walder says the economic recession has helped in a way, by drawing attention to oft-ignored bus interests, and galvanizing bus advocates to rally to protect their routes. Rendering of completed First and Second Avenue Busways, highlighting: (1) pay-on-the-street stations; (2) lower, real-level entrance to speed boarding; (3) lights that buses will be able to "hold" green; (4) painted bus-only lanes. 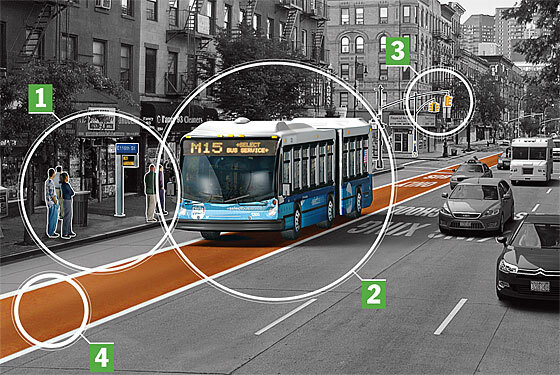 Image from NYCDOT and MTA via New York Magazine; illustration by Joe Zeff design.